Item Description: editorial, The Daily Progress (Raleigh, N. C.), 13 June 1864. So Gov. Vance carries a travelling suite with him. This travelling suite consists, we suppose, of one or more of the “Shade Aids” who are now drawing forage, fuel, commutation for rent, &c., all to be paid for by the State, for services they are not performing. Mothers, sisters, wives and aged fathers cannot go to Richmond or Petersburg to look after their maimed and mutilated loved ones, because all the railroad transportation facilities are required to do the work of the government, but Gov. 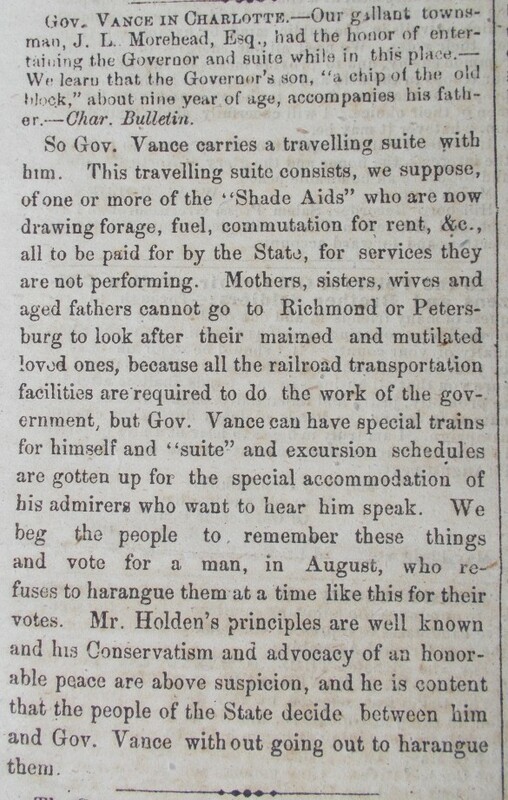 Vance can have special trains for himself and “suite” and excursion schedules are gotten up for the special accommodation of his admirers who want to hear him speak. We beg the people to remember these things and vote for a man, in August, who refuses to harangue them at a time like this for their votes. Mr. Holden’s principles are well known and his Conservatism and advocacy of an honorable peace are above suspicion, and he is content that the people of the State decide between him and Gov. Vance with out going out to harangue them. Citation: editorial, The Daily Progress, 13 June 1864, page 2 column 1. Call number: VC071 C748 folder 4, North Carolina Collection, Wilson Library, University of North Carolina at Chapel Hill. This entry was posted in North Carolina Collection and tagged family, Governor Zebulon Vance, politics, soldier conditions, William W. Holden. Bookmark the permalink.